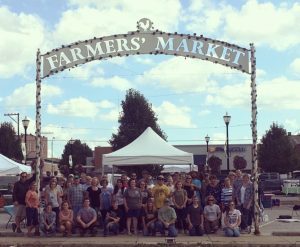 Kokomo Downtown Farmers Market: A Market on a Mission. Kokomo, Indiana is known as “the City of Firsts”. It was in Kokomo that the first American automobile was commercially produced, the first pneumatic rubber tire, first carburetor, first stainless steel, first push button car radio, the first commercially-produced can of tomato juice, and first mechanical corn picker. Kokomo residents are proud of their city’s innovative, entrepreneurial heritage. 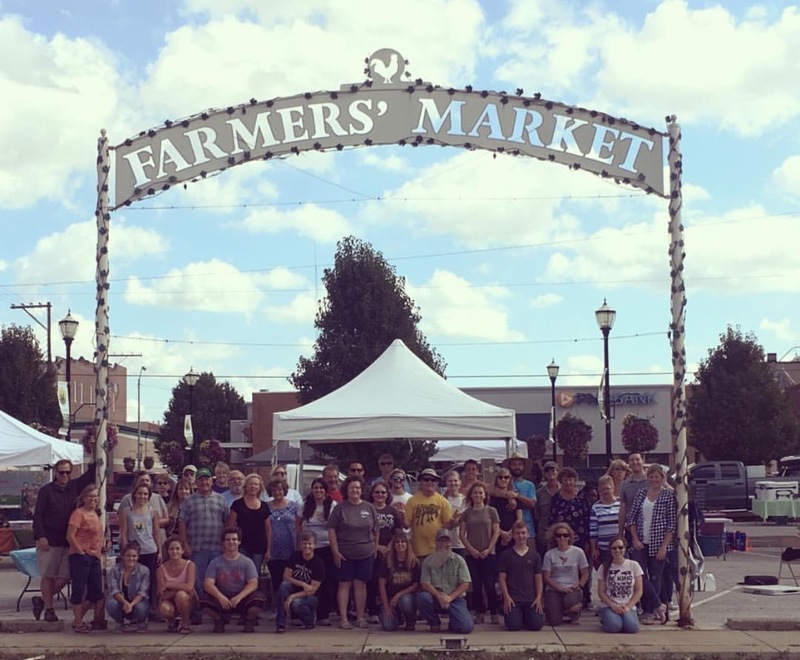 Established 16 years ago, the Downtown Kokomo Farmers Market combines delicious, locally-grown food and true love for community. Farm-to-fork events such as FRESH Taste Kokomo have been huge crowd pleasers. The market also has a board and community dedicated to making sure that everyone has access to fresh food through a self-funded Double Bucks program that extends the buying power of SNAP recipients. A 2015 SNAP Support Grant has also contributed to more fresh food in the hands of SNAP users and education through weekly market demos, kitchen tool giveaways, and outreach opportunities. Be the first to follow along with “the City of Firsts” on Instagram, as they takeover through December 3rd! Adrienne Akers: The KDFM has been in operation for 16 years. We are operated by a board of directors and managed by me, an independent contractor. Our board consists of sponsor-appointed members, vendor members, and patrons. Besides me, market staff included Wellness and Outreach Coordinator Laura McGuire-Cone. We operate each market day through the magic of amazing volunteers. While our market has been around for a while, it has a rocky history. Until 2014, we were quite small and fairly unknown with just 10 vendors. After years as a frustrated vendor, I decided to take on the market master position offered to me at the end of the 2013 season and was determined to help our small crew of awesome vendors find some real success. We have grown to a roster of 45 vendors. We started a Midweek Market last year; we operate a popular weekly modified CSA program through our regular season; we organize three special farm-to-fork fundraising events, a winter market, and pre-season pop up markets. The KDFM is proud to be mostly a producers’ market. Everything they sell was made, grown, or raised by them within 50 miles of our county. AA: The KDFM offers a variety of market opportunities in an urban setting. Each season, we are open Saturdays for 24 weeks. During that time, we also run a 10-week Midweek Market on Wednesdays at our regular market spot. These markets are outdoors unless the weather is dangerous. This year, we partnered with the local YMCA and can use their facility when the weather isn’t safe to be outside. During November and December, we are open on Saturdays at an indoor location. We use that same location to operate “pop up” markets from January-March. Our market is all about community. It’s a happy, vibrant place where people come together to meet new and old friends, listen to local music, learn, and support their fellow locals. We get a ton of support from our ever-growing community of shoppers and constantly try to show them our appreciation with fun free events like Bike to Market, beer and wine tastings, a free weekly kids’ club, cooking and food preserving demos, an on-site wellness specialist, a tomato tasting, an apple tasting, an ice cream social, caramel apple day, and more. One of our goals is to provide a weekly dynamic glimpse of our awesome little city and all the talent that’s right here. AA: As mentioned above, we offer lots of fun free events each season like Bike to Market, beer and wine tastings, a free weekly kids’ club, cooking and food preserving demos, an on-site wellness specialist, a tomato tasting, an apple tasting, an ice cream social, caramel apple day. We accept WIC and SNAP and have a self-funded Double Bucks program that doubles SNAP benefits up to the first $10. Our Farm-to-Fork events, which include an at-market barbeque, Fresh Taste Kokomo, an evening of celebrating locally-grown food and the local chefs that prepare it, and our off-site Farm-to-Fork Dinner get people really excited. They start asking questions about the events as soon as our season begins. While these events are fundraisers, we use them to really promote the market, local food, our small farmers and the local restaurants we partner with. AA: Through our USDA SNAP Support Grant, we advertise in print, on radio, and through lots and lots of signs, posters, banners, brochures, and through a monthly market guide we put out. We do lots of outreach, setting up an info booth at our libraries, at First Friday for example, and meeting with people at service agencies, veterans housing, women’s shelter, and giving presentations to interested groups. We depend a lot on social media (Facebook, Twitter, and Instagram). As far as advice, I know in my town, the most important thing I had to do was provide education about our market. When I became market manager, we had a core group of about 60 people who came out to market each week and got what we were trying to do, but most of the community didn’t know or care. I had to get out and give the most basic information about location, dates, and times, but I also had to let people know the market is a place for everyone. I had to explain how supporting local farmers and businesses has a huge impact on our city’s economy. I also had to get people to thinking about and understanding the positive effect that eating fresh, local food can have. I had to let people know how much we do to make sure everyone in our city has access to fresh food, like accepting SNAP and WIC. Finally, we work hard to keep the KDFM a happy place! Vendors, staff, and volunteers smile, are polite, happy to share their knowledge, and are helpful always. In the promotion, I almost always call the KDFM “the friendliest little marketplace in Northcentral Indiana” and I truly believe it is. Once we started educating and focusing on one of our big strengths–friendliness–and new people started coming to market more, word of mouth was our best friend. AA: We are a marketplace with a mission! The KDFM isn’t just about buying and selling. It’s about teaching, growing, inspiring others, and becoming better at serving our community. We believe everyone in our wonderful community deserves access to fresh, local food and our USDA SNAP Support Grant has given us the means to open the market experience up to all families and talk with them about budgeting for and cooking with fresh food. We’ve had many success stories, including a gentleman relying on SNAP benefits who changed his diet from fast food and frozen foods to fresh foods he learned to cook with thanks to the weekly advice and recipes he received from our Wellness and Outreach Coordinator. He lost nearly 20 pounds over the course of last season. Several families who now use their SNAP benefits almost solely at the market to purchase CSA shares. Every couple weeks I get an email or message on social media from a couple people who are new to shopping at our market and who want to let us know how much they appreciate the welcome they get from market staff, volunteers, and vendors.